PS - Extinction if you read this some time did you get the song twice ? Also just to be sure they didn't take the song away from your inventory ? Re: IMVU staff did good - stories . .
No I didn't get any reply messages after sending that song , I check the client inbox almost every day and next messages every day . was using IE at the time of the glitch . Awesome topic idea. I think this is a great idea. I was having an issue with items of mine being flagged just randomly all of a sudden. 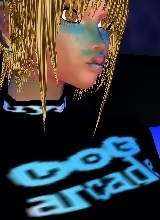 Even though everything was by IMVU's rules of what is GA and AP when it comes to pictures, my words were different. After making up a ticket about a profile image of mine that was in fact within IMVU guidelines, I kept getting blanket responses from some random CS agent. (Sorry, I won't name this CS agent.) He never offered any true and real information to me, and even quoted me the wrong IMVU guidelines. All in all, he only created confusion in the matter. I had to open the second ticket to try and get some help, with the help I was receiving. I wrote a ticket meant to go all the way to the CEO of IMVU. I didn't get the CEO, but instead got Byronbien. Right away I could tell, I was talking to Byronbien himself, and not a copy/paste spreadsheet. Took only his first reply to tell me that. He took the time and answered all of my questions. He spoke to me like two people who were friends would speak with each other. Me not being a VIP I usually have to wait a while before I get replies to my tickets. I used to have VIP though, and this ticket with Byronbien was brought to a close faster than my quickest VIP ticket. Even though I didn't win the grand or one of the main prizes . .
if only to encourage users to enter more often . So it's nice they may have listened .